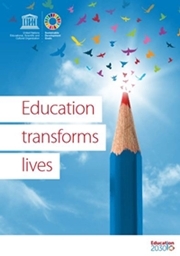 UNESCO leads the coordination and monitoring of the Global Education 2030 Agenda through Sustainable Development Goal 4 and using the Education 2030 Framework for Action as a roadmap. Laboratory of ideas: anticipating and responding to emerging trends and needs in education, and developing education policies based on research and country priorities. Standard-setter: developing standards, norms and guidelines in key education areas, and monitoring the implementation and dissemination of successful educational policies and practices. Clearinghouse: promoting the development, implementation and dissemination of successful educational policies and practices. Capacity-builder: providing technical cooperation to develop the capacity of Member States to achieve their national education goals. Catalyst for international cooperation: initiating and promoting dialogue and exchange among education leaders and stakeholders. contributing to dialogue at country level including through the forming of coalitions connecting public authorities, business, education, training and labour market stakeholders. publishing an annual Global Education Monitoring Report that tracks the achievements of countries and the international community towards the new global agenda. Despite significant progress sub-Saharan Africa still accounts for half of the world’s out-of-school children and lags behind in many important areas of education, hindering socio-economic development. UNESCO’s Priority Africa includes five flagship education programmes with youth and gender as crosscutting priorities. Gender equality in education remains a major challenge and is a global priority for UNESCO. Its Priority Gender Equality Action Plan tightly links gender equality to the right to education for all and the realization of the new global education agenda and pinpoints access, equal learning opportunities, gender sensitive laws, policies and plans and transformative education content. Other important areas include boosting literacy learning, higher education, enhancing teacher development, improving learning and expanding innovative learning opportunities.